A few patients have expressed concern in the past about receiving dental X-rays because of the radiation they give off. However, according to your dentist in Tulsa, many leaps in technology have allowed this radiation to be significantly reduced, so the risk of not being able to provide a proper diagnosis far outweighs the risk of exposure to X-rays. Furthermore, without a clear picture of what’s happening inside your mouth, we can’t know for sure if there are underlying issues the naked eye can’t see. That’s why your dentist is writing about the many benefits of X-rays and how they can help you and your family avoid dental disease. Many dentists, including your dentist in Tulsa, have switched to a digital X-ray machine for dental practices. Even though X-rays machines used in dental practices are designed to minimize radiation to begin with, digital X-rays minimize it even further, so you can rest assured that your exposure is at an absolute minimum. According to the American Dental Association (ADA), your routine exams and cleanings need to be conducted every six months to ensure there are no problems in the mouth. With these exams comes an X-ray, typically a bitewing. A bitewing X-ray focuses on the crown portion of your teeth and highlights early signs of tooth decay. 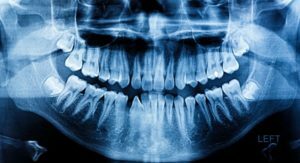 X-rays allow your dentist to view an extremely detailed picture of your mouth, teeth, and gums. They can see in between and inside your teeth where the tip of your roots and bone are. They can also see the bone that sits underneath your gums, an area that is not visible to the naked eye. By taking X-rays, your dentist can rule out any tooth decay and gum disease that might be apparent. Furthermore, if you tell your dentist that you’re having an issue in your mouth, they can more accurately confirm the source of your problem before offering a diagnosis. Keep in mind, your dentist will not pursue treatment unless they are 100 percent sure of what is happening in your mouth. Dentists are actually in a very unique position to catch early signs of disease better than general practitioners, so it’s worth it to take advantage of the technology. While these machines are considered safe by the ADA, your dentist remains proactive by providing you a leaded apron to cover your abdominal area and a leaded collar to protect your thyroid. If you are pregnant or breastfeeding, be sure to let your dentist know beforehand, even though necessary X-rays don’t need to be avoided. To keep your oral and overall health in check, schedule an appointment with your dentist in Tulsa today! It’s worth it to keep peace of mind that you’re in good shape! Dr. Angie Nauman attended dental school in Nebraska and since then has continued her education in many facets of dentistry, including oral appliance therapy for sleep apnea, Invisalign, laser dentistry, sedation dentistry, Six Month Smiles, and Clear Correct. To learn more about her preventive treatments and practice, contact her at (918) 254-8686 or visit her website.